Several small plates, working in unison, can often be just as effective as one large plate. For proof, you need only look at this Bohemond Breastplate and Pauldron Set, which mimics the look and design of the medieval coat of plates, entirely in leather. 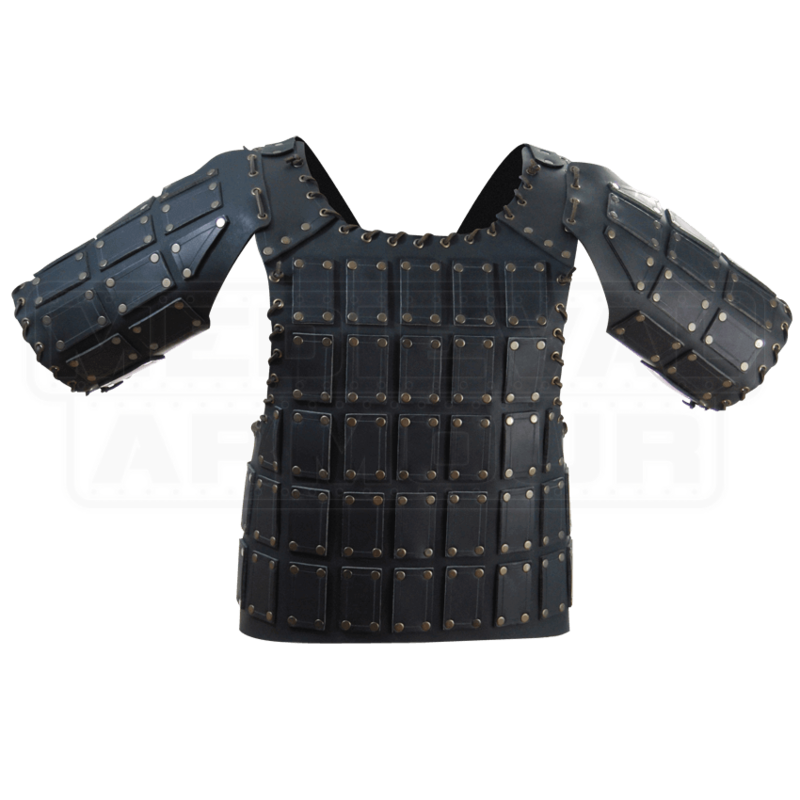 This armor is made from two different weights of leather, although this variation does little to hinder its protective ability. This is because the base layer, which is 3-4 oz. buffalo leather, is adorned with several close-set square plates of rigid 9-10 oz. buffalo leather, creating a solid and sturdy design that provides plenty of protection with ease, without forcing the wearer to sacrifice anything in terms of speed or agility! Each plate is individually riveted onto the base layer, and the shoulders are further reinforced for added strength and durability. Laced leather accents adorn the neck and flanks of the armor. The Bohemond Breastplate and Pauldron Set offers a slight variation in its design, as well as in its name, too. It comes complete with shoulder and arm protectors, although they classify as pauldrons in only the loosest sense of the word. 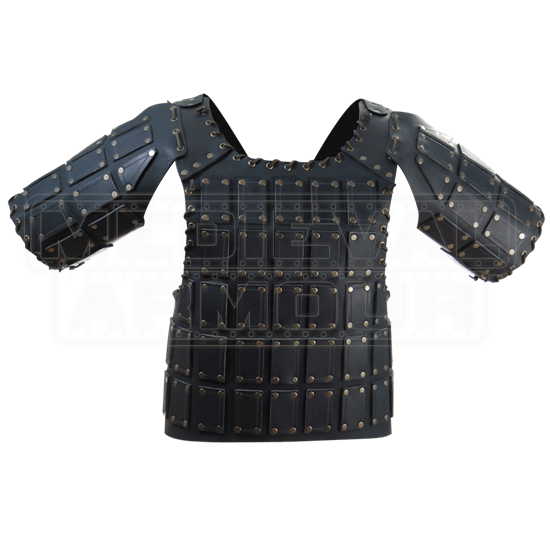 Instead, they are short sleeves, secured to the shoulder grommets with leather lacing, which are fashioned in the same manner as the armor - a light leather base with stiff leather plates affixed to its surface. It is available in four sizes, and each size features a quartet of leather straps with buckle closures for wearing. One strap each goes over each shoulder and crisscrosses over the back, while the last two secure around the back. Because it fits more around the waist than the chest, the armor is sized according to the waist, as opposed to the chest. Whether you consider this to be dwarf-made or man-made, crusades inspired or fantasy imagined - however you envision and classify it, you can always be sure that this Bohemond Breastplate and Pauldron Set will offer you a superior level of protection, as well as a lightness and comfort that makes it a suit of armor that your fellow warriors will certainly be envious of.